Tracing Your Roots: Is My Spouse Kin to a Man Who Freed 81 Slaves? Sleuthing the tale of a “bachelor” slave owner who freed those enslaved at Virginia’s Tynes Plantation in his will. I have been trying to research the connection between the family of my father-in-law, Timothy George Tynes (April 13, 1927-November 1983), of Cambridge, Mass., and a slave listed in an 1802 will. The earliest ancestor on the direct paternal line who I can pin down is Timothy Tynes (1832-1885), who was born in Virginia, and I believe that his father’s name was George. I found the link between Timothy Tynes and “George” via the marriage record of Timothy and Sarah Hogan (1836-unknown). 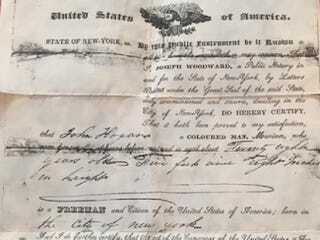 Sarah’s father is listed as John Hogan, and we have a copy of papers listing John Hogan as a “free coloured man” living in New York in 1829. I also found a copy of the 1802 will of a white slave owner named Timothy Tynes in Isle of Wight County, Va. I think he might be connected to my father-in-law’s family. According to the will, plus other accounts, Tynes was a bachelor who ran the Tynes Plantation in Smithfield, Isle of Wight County, Va. Much to the consternation of Tynes’ white relatives, he freed all of his 81 slaves upon his death in 1802. He left a majority of his land to one slave Beck (thought to be Rebecca) and her children. In the will, he lists all of the slaves by name, including one named George. Some of their descendants are named in an article in the Aug. 10, 1988, edition of the Smithfield Times. When we began our research of Timothy Tynes, who was born in Virginia in 1832 and married in Boston by 1854 to Sarah A. Hogan, we considered the circumstances that brought him from Virginia to Boston. We asked ourselves: Was he a free African American who migrated north, or was he a victim of slavery who escaped the South? Was he born free, or was he emancipated sometime before 1854? To get a better understanding of his circumstances, we examined the African-American population living in Boston near Timothy Tynes and his in-laws during the 1850 and 1860 federal census enumerations to locate an individual who may have accompanied Timothy on his journey north. Boston and other Northern cities were popular destinations in the migration of free and fugitive African Americans northward in the decades leading up to the U.S. Civil War. Slavery was illegal in many Northern states by 1850, though dangers still loomed for black people because of the Fugitive Slave Act of 1850, which was part of a group of laws designed as a compromise between free states and territories and slaveholding states. As covered in a previous Tracing Your Roots column, the law required that any runaway or escaped slaves be returned to their slave owner upon capture, even in Northern states. Sometimes free blacks were captured instead and sold into slavery, as happened in the infamous 1841 kidnapping of Solomon Northup, a New Yorker whose widely read memoir, 12 Years a Slave, eventually made it to the big screen in 2013. Before or around the time of Burns’ trial, your Timothy Tynes may have traveled with other African Americans from Virginia to Boston to look for employment, housing and a wife. Additionally, he may have sought out the assistance of friends and relatives once he arrived, since it does not appear likely that he was acquainted with his in-laws, who were born in New York and were residents of Boston as of 1840. Other established African Americans may have provided support and advice to help Timothy navigate a new city. While we could not locate Timothy Tynes in the 1850 census, the Hogan family was enumerated in Ward 5, Boston, both in 1850 and in 1860. Thus, when we compared the African-American population living in Ward 5 in 1850, we located almost 20 individuals who were born in Virginia (between 1795 and 1843) and listed as either mulatto or black. And while Timothy Tynes may have been acquainted with some of these individuals back in Virginia, we were unable to locate another individual with the surname Tynes (or variant spellings) who was born in Virginia and was living in the Boston area. Furthermore, we were unable to place any of these individuals as immediate neighbors to the Tynes or Hogan families. However, we suggest that you continue to research the black Virginia-born neighbors of Ward 5 to see if any may have known Timothy back in Virginia (e.g., lived in the same town or were enslaved by the same person). Our next step was to check vital records in Massachusetts to locate a more specific birthplace for Timothy in Virginia. To do so, we examined not only his marriage and death record but also some of the birth records of his children with Sarah A. Hogan: Harriet N. Tynes, Sarah Elizabeth Tynes and Albert Edward Tynes. All of the records, save Harriet’s, placed Timothy’s birthplace in Norfolk, Va., just over 30 miles from Isle of Wight County, where the Tynes Plantation was located. Based on the shifting definitions of “Norfolk’s” boundaries over time, it’s possible that Timothy was referring to Isle of Wight. Evidence strongly suggested that Timothy Tynes was most likely born in Norfolk, Va., about 1830-1834. When we examined the 1830 census for the borough of Norfolk, we located a strong lead. The two enumerations for free African-American families with the surname Tynes were for Patience Tines and Patsey/Palsey Tines. Both households had small children enumerated, providing evidence that one of these households may have been the place where Timothy was born. Most notably, when we compared the names with the 1802 will, we found listed among the freed slaves the name Patience. We suggest that you look into her further to see if she is related to Timothy. Interestingly, in the household of Patience Tynes is a male slave age 36-54 years old. We wondered if she could have been emancipated and her husband still enslaved. This scenario was not unheard of, as noted in a previous Tracing Your Roots column. “It is reasonable to assume that the 42 percent of the free black slave owners who owned just one slave probably owned a family member to protect that person, as did many of the other black slave owners who owned only slightly larger numbers of slaves,” the column states, citing research done by the pioneering African-American historian Carter G. Woodson. Could this possible spouse have been your George? When we examined the 1830 and 1840 censuses for a record of George Tynes, we were unable to locate a record in the state of Virginia. However, if he were still enslaved—whether in Patience Tines’ household or by another owner—then there would have been no record of him by name at all in either census. There are many white Tynes households in Virginia (in the “Norfolk” area) with slave populations, however, without more information, it would be difficult to pinpoint the residence of George. We would suggest examining the marriage records of Norfolk to determine who Patience Tynes/Tines married, as well as the possibility that George Tynes/Tines married in Norfolk. These records are available at your local Family History Center. You might also search for a will or probate records for Patience to see if any answers lie there. Additionally, you might look at the indexes to Norfolk deeds, since the freed slaves from the 1802 will of Timothy Tynes may have purchased or mortgaged land. These records are available for rent (on microfilm) at the Family History Library. Although approximately half of her husband’s autosomal DNA was inherited from European ancestors, his paternal haplogroup is of recent African origin. Since this Y-DNA signature is inherited from his direct paternal ancestors, it seems unlikely that he is descended from Timothy Tynes, the white slave owner, through the enslaved man George. It may still be worth pursuing testing to definitively rule out this connection due to the small possibility that the slave owner was carrying an African Y-chromosome. With that in mind, in order to determine whether her husband is genetically linked to the slave owner, Timothy Tynes, we would typically recommend tracing his known descendants to the present day and asking one of them to take a DNA test. Since the ancestral line in question is her husband’s direct paternal line, it would be optimal to identify a living direct male descendant of the slave owner, so that they could compare both his autosomal DNA and Y-chromosome DNA to that of her husband. However, since Timothy was reportedly a bachelor, this may not be possible. In this case, you would, instead, try to identify direct male descendants of one of Timothy’s brothers or paternal uncles to DNA test. If this proves too difficult, another option is to build the slave owner’s family tree and then search her husband’s DNA matches for people who share ancestors with Timothy Tynes, the slave owner.